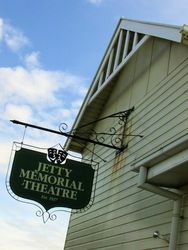 Jetty Memorial Theatre commemorates those who died in service or were killed in action during World War One. 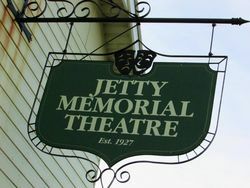 Jetty Memorial Theatre was originally opened as a public hall in 1928 to serve as a memorial to soldiers from World War One and to provide a space for community and social events. The hall was gazetted as a war memorial hall on the 24th July, 1931. 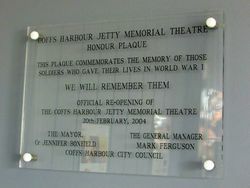 In 1990 the second major refurbishment in the building’s history was completed by The Coffs Harbour Vietnam Veterans. Later in 2003, the theatre was closed and underwent a major restoration, notably funded by the Coffs Harbour City Council, which transformed the building into a state-of-the-art 250-seat contemporary venue capable of being adapted to a wide range of community and touring shows. The theatre was officially re-opened in 2004.